Most types of Commercial and Industrial Floors Cleaned, polished and sealed in the Cheshire area. Since 2001 we have restored and cleaned industrial and commercial floors in Cheshire fitted to business companies and centres, shops, public buildings, nurseries, local schools and also Cheshire West And Chester Council properties. Many examples of this type of floor are marmoleum floors, vinyl flooring, safety flooring, Amtico and also stone floors. Despite regular on site maintenance, this type of flooring will eventually lose it’s appearance and become dull and grimy due to a build up of surface dirt and scuff marks. The cleaning system we use, in most cases can restore old or tired looking floors to as new appearance. Many areas of high traffic flooring such as canteens, kitchens and public building areas will require periodic cleaning maintenance and perhaps stripping to keep them looking in pristine condition. We can strip and clean your floor to remove grime and scuff marks, old floor polish and grease build up to reveal a fresh new surface. 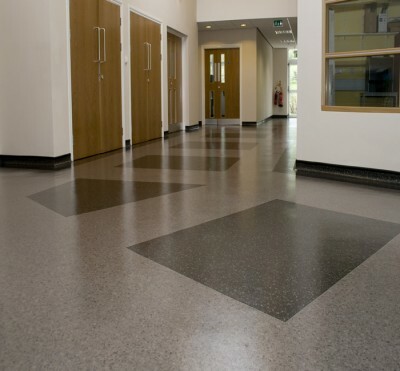 Additionally we can advise you if an application of high solids floor polish would be appropriate to protect and maintain it’s appearance for years to come. Areas covered for Industrial and commercial floor cleaning include: Alderley Edge, Altrincham, Chester, Congleton, Crewe & Nantwich, Frodsham, Hale, Holmes Chapel, Knutsford, Lymm, Middlewich, Northwich, Sandbach, Tarporley, Winsford, Wilmslow, Prestbury, Warrington and Woodford. See some good examples of vinyl flooring stripped cleaned and polished in Cheshire. 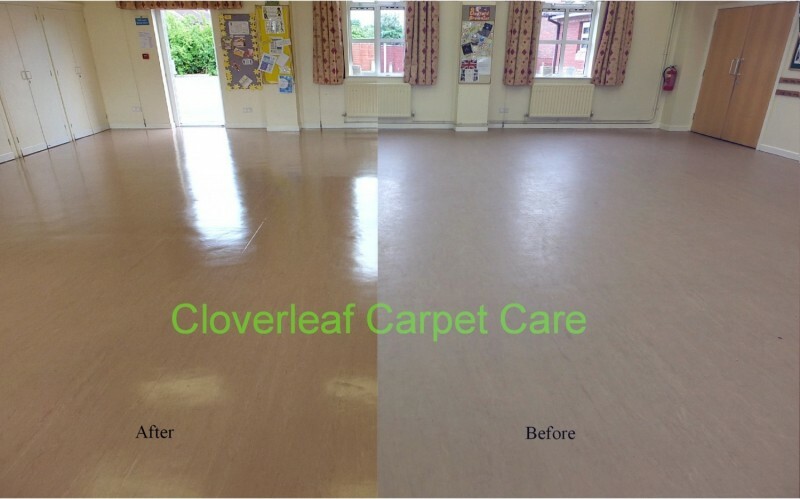 Below is an example of work completed at a Church hall in August 2013. The floor which is vinyl marmoleum was in a soiled, dirty and scuffed condition being 20 years old. Regular cleaning by on site cleaning staff could not improve the look of the floor nor remove the black scuff marks. The floor was stripped and cleaned using specialist floor cleaning machines and equipment that revealed a bright and almost new floor. Three coats of high solids wet look floor polish were applied to give a superb and resilient finish. The floor will now be easy to clean and mop. The floor is slip resistant, will not scuff with black marks and will also maintain it’s looks for many years to come. Floor stripping and re-sealing a commercial floor with acrylic polymer polish. Below was a project in 2014 to restore a very old and worn vinyl floor in a commercial building. The property needed handing back to the landlord in good condition by the tenant. This floor was used in a busy work environment for 20 years and was very scuffed and also had a heavy build up of dirt. The old polish had also become discoloured. As the image shows, this floor was in a very bad state and an initial test showed that the floor responded well to stripping. This floor was stripped of grime and old polish using an abrasive head on a rotary scrubbing machine and restored to acceptable condition. The floor was then neutralized to lower the PH caused by stripping chemicals. Several coats of wet look polymer floor polish was then applied to give an outstanding non scuff easy clean finish that will last for years to come. Needles to say our client was very happy with the amazing results! Below is part of a large vinyl floor in a canteen area at a local company which is some 30 years old. The floor was stripped clean of dirt and grime. The old polish was also removed of which most had worn off. The floor was then sealed with a high gloss polish that is non slip. The client was extremely happy with the floor which will now be easy to mop and maintain and create a cleaner environment for the employees. If you require a friendly free no obligation assessment and quote for your industrial, commercial or vinyl flooring, please get in touch. We can visit your property to see what your requirements are and leave you with a quote for your consideration.